When Juliana was born we were ecstatic ! She was such a good baby. At 10 months she still was not on target and would do a blank stare. By the time she was 5 and barely talking I was tired of listening to the Dr say she is fine she just has ADHD. I got my own second opinion and Juliana was diagnosed with Autism. She did not speak much so she was given medication. Juliana is now 10 and is verbal. With her autism she is very busy. Being physically 10 she functions mentally at a 3 year age and needs constant supervision. Juliana does not realize danger and she is just happy and loves life. Anyone that has a child with autism can tell you each child is a blessing! They are the sweetest souls. With the energy she has it is challenging for the entire family. The other children aren't able to get all the attention they deserve as Juliana is the focus. I would never have guessed what a true vacation could be until we were blessed with a chance to travel with Autism on the seas. Juliana absolutely thrived with the cruise. She has grown so much I can't even believe it. The staff is amazing! Juliana talks about the cruise daily. She does not forget the people and speaks of the staff and new friends and can't wait to see them again. With Juliana persistent I want to go on the big boat and see "Brittany" ( as well as many other staff members - she recites to me daily) we decided to try to fundraise for another opportunity to travel with AOTS again on 3-24-18. With 6 surgeries in our home in 2016 with 1 being for Julie as well as being a 1 income family while my husband is in school we aren't able to afford a vacation like this. We would be truly grateful for another opportunity. Autism on the Seas is a non-profit company that allows families like ours to experience a vacation that at one time we would have imagined to be impossible. 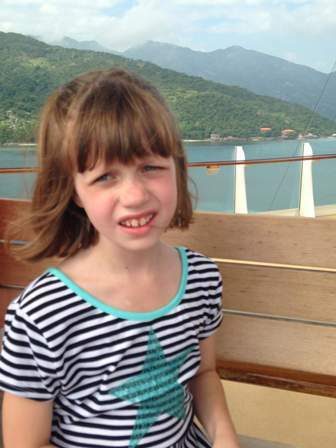 They arrange specific special needs accommodations with the cruise lines and they provide professionally qualified staff to assist us with expedited port check-in, meal assistance, pool time supervision, beach excursions, respite (time for Juliana to be well cared for while the rest of the family can do other things), and many other perks and assistance. Autism on the Seas also provides pre-cruise professional consultation and valuable resources, including connecting with other families for support. Any donation would be very much appreciated. All money is tax deductible and goes directly to our fundraising efforts for a cruise with AOTS.